(Escaping with a single girlfriend last year — SaneMom)Being a new mom is both exhilarating and exhausting. Between trying to get the hang of a new sleep schedule, learning how to take care of baby and maintaining a somewhat sane household, there isn’t much time for you. Add in new mommy friends to the mix and you’re left with little time for your pre-baby friends. But, just because your life has made a major change doesn’t mean that you have to break off your relationships with your single friends. In fact, maintaining those relationships can be healthy, reminding you that you are a multi-dimensional person and there is more to you than your new “job title”. Here are some tips you can utilize to help combine your single friends with your new mommy job. We’re moving to a new house. I’m excited, nervous and anxious. After almost 11 years in our first home, we’ve decided to move. It was a sudden decision brought on by a next-door neighbor who has become unbearable. Just three years ago, we completely remodeled our current house. I never thought we’d move. Suddenly, that changed. The house next door went into foreclosure and our longtime neighbors moved out. In moved a couple with six sons. Within a month, their house caught on fire and was rendered unlivable by city officials. Did they move out? No! Despite financial offers to move, they have stayed, turning the house into something that resembles a burned out, junk-filled, scary mess. 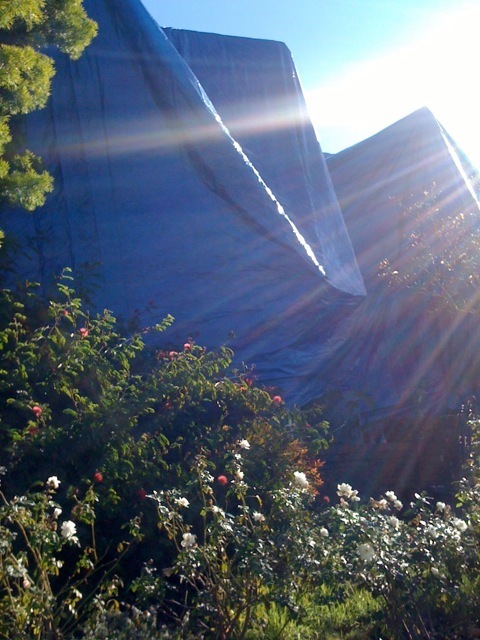 Last week, they covered the entire house in a huge blue tarp. Some great posts around the blogosphere this week, see a few of my favorites below. Fun in the leaves earlier this weekMy Son has a Superpower, by Redneck Mommy. Thought-provoking post on the invisibility of the disabled … ever find yourself looking the other way because you don’t want to stare, and end up pointedly ignoring someone? Yup, me too. Q of the Week : How do you set personal boundaries? I’m amazingly bad at setting boundaries. I bite off more than I can chew, and then have little left for what I really want to do. I say yes and then regret it, hating to disappoint people. I pick up the phone when I should be working, and then fail to tell the caller I can’t really chat, feeling antsy half the time I’m talking. I say no when I’ve planned badly, and have to skip out on something I really wanted to do because I didn’t set good boundaries elsewhere. We all have our escapes. One of my favorites happens to be reading mom-blogs as I’m sure you know if you’ve been around here much. I don’t have that many that I follow regularly, and I’ve slowed down my reading times, but I still use them as a real escape/pleasure several times a week. One of my favorites is P-dub aka The Pioneer Woman, and I recently referred my house-mate “A” to one of her recipes that I thought she’d love, thus introducing her to the site. At dinner the next night, we had mutual friends over and were all sitting around the table chatting. A had made a dessert she found on p-Dub’s Tasty Kitchen, and the subject of mom-blogs came up as we were devouring it’s pear and ginger crispiness. Being my philosophical self, I tried to analyze why P-Dub and dooce, the two most-read blogs I was aware of, were so popular. Things like transparency, honesty, great photography, and belches-and-all reality were tossed around for a minute or two. Q of the Week : Holiday burnout tips? Pretty please? Fynn’s list for this year, conceived and mostly executed by his older brother. Coming home from my run this morning, I had to weave around huge stacks of artificial christmas trees lying on the sidewalk, and dodge the man trundling them slowly into the store. I shuddered a bit. The Holiday Season is upon us, and every year it seems to get a bit crazier and even less sane. The shopping starts earlier, the sales are more desperate, and travel frenzy messier, and the expectations harder to manage. I’m not a scrooge, but I think we take the holidays easy. While doing my too-often perusal of The Women’s Colony, I came across this gem. It’s about grandma being grandma and herself too, and not always being ready to watch her grandkids at the drop of a hat. She has a few things of her own to do also! Tonight my beloved daughter called to see if I would babysit her two children on Saturday night. I love my grandkids (ages 3 and 5) to pieces, but if I said yes, it would be the third time I’ve watched them in one week. I declined and told her I had already had plans to see a movie and have dinner with her dad. I could hear the irritation and disappointment in her voice. I rarely say no to her frequent requests to watch the children so that she can go out to dinner with my son-in-law (love him too), go to her book club or go out with the girls for a night on the town. Guess what? Grandma’s tired. Grandma has a life. Grandma has places to go and people to see. I was so glad to see this this grandma’s perspective aired, and enjoyed the comments on it also. I get the very occasional babysitting from my father-in-law, but hesitate to ask much and know he’s got a lot going on. I don’t live near any other family really, and often wish I did (not just for the prospect of free babysitting!). How much kid-minding do you get from family? Ever feel guilty about it or sense that they feel taken advantage of? Curious. Set your holiday limits now, if you haven’t already! How many trips? How much money to spend? Where will you spend them? Simple rituals to start? Perhaps you’re a great advance planner and have everything nailed down, if so please share your tips! If not then set aside a half hour to get some thoughts and numbers and dates down on paper, with your partner. Plan a menu. Divvy up responsibilities. Start making multiples of an easy gift. Make SURE you make a budget, and stick to it! Piggy banks are not for just the kids, get yourself an envelope or jar and set aside for your holiday spending. Any tips on how to make it easier? Please share!